I love, love, love musicals - on stage, at the movies, on my television. I had friends growing up who performed in local theater productions so I got hooked early in life. To this day, if I come across a cheesy musical while channel surfing, I find myself immersed in no time. I'm lucky to live about 30 miles from Indianapolis - a city with some great options when it comes to seeing a show. Not only do traveling Broadway shows, like Wicked and Jersey Boys, make their way to town, but we also have some great local theater companies that put on wonderful productions - both musical and not. Last night I went to the opening night of "All Shook Up" at Footlite Musicals just north of downtown Indianapolis. The musical is loosely based on Shakespeare's "Twelfth Night" and features Elvis Presley classics. This show features performers ages 18 to 25 and their enthusiasm and the intimate feeling of the small theater really made the show. It definitely wasn't a Broadway show, but for less than $20 a ticket, it was a good night's entertainment. It runs this weekend and next, so if you are in the area, you might want to check it out. I love being able to support the local arts scene and have a night out with friends! Speaking of a night out with friends, another great option is Heartland Actor's Repertory Theatre's (HART) Shakespeare at White River State Park in August. I think this is the third year that this local theater group has staged a Shakespeare play at the Amphitheatre in downtown Indianapolis. 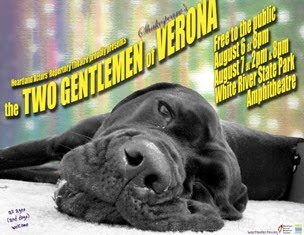 This year they are doing "the Two Gentlemen of Verona." You can bring a picnic (and some wine), a blanket and settle down to enjoy some great acting and it's all FREE! hi!! i'm over here from the friday follow! can't wait to read more!! I never knew you liked musicals. I have always loved them. Love your "about me" and how you're in the middle. So clever! Found you via Friday Follow and already added your blog to my reader! Hope you have a wonderful day! Came over from Friday Follow! Have a great day!!!! Thank you so much for the follow! I'm following you back! I can't wait to read more of your blog! I saw a videotape of Into the Woods on stage and I loved it! I want to see it again so much! Hi! 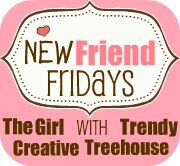 I'm your newest follower from Friendly Friday! I love musicals and opera's also ~ we took my 19 year old to see Cats when she was 4 and she's been hooked ever since. Les Miserables is my favorite.. I've seen it atleast 5 times. I love musicals, but can't ever convince my husband to go see any with me! Great blog! I'm stopping by from NFF to say HI-I know it's Saturday- Our internet was not working for most of yesterday:)! There is so much that goes on around here that I had no clues about!